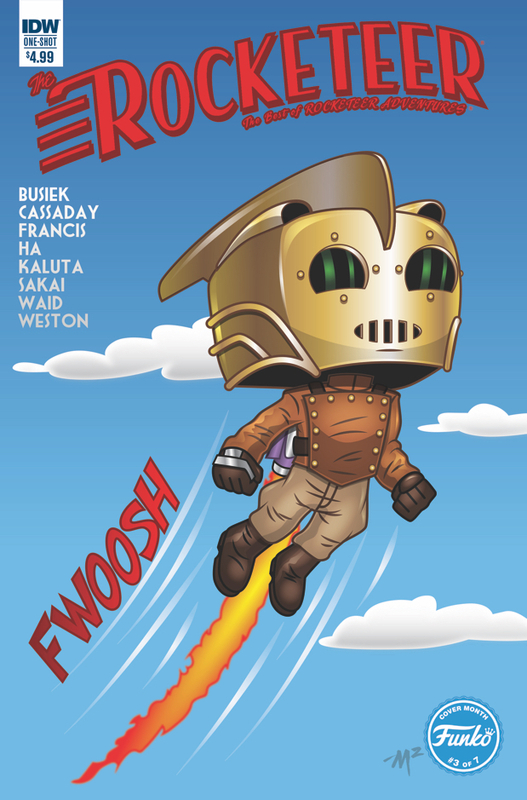 When most people think of the Rocketeer, they think of that Disney movie from the early 90’s. That version of the character might conjure up certain feelings for some people, whether it be good or bad. One thing everyone can agree on though, is that it was a great homage to the matinee serial heroes of the 1930’s to the 1950’s. And that was exactly the intent when creator Dave Stevens first brought the character to life in the pages of his own comic series in 1982. The premise is simple: in 1938, stunt pilot Cliff Secord discovers a mysterious jetpack that allows him to fly, and the cities of Los Angeles and New York of old serve as the backdrop to his adventures. The Rocketeer: The Best of Rocketeer Adventures is a collection of five of the best, self-contained stories from IDW’s Rocketeer Adventure series. The stories collected here are “The Rocketeer”, “Dear Betty…”, “It Ain’t the Fall That Kills Ya…”, “TKO”, and “A Dream of Flying”. Each of these stories are told by a different creative team, all of them giving their interpretation of the character and the world he lives in. Although differing stylistically, they all feel exactly as they should. They are a fitting love letter to the era they are based in. My favorite of the stories was “Dear Betty…” With Cliff’s girlfriend Betty working as a nurse on the home front, Cliff is off fighting WWII. She waits day in and day out for his letters, which she gets on an irregular basis. When she receives his letters, they typically sound like business as usual overseas. What she doesn’t know, though, is that his adventures are more fantastical than they initially seem. This collection is full of stories that you have to see to believe. Reading the stories, I got so involved in the world, that I was itching to read more of them. It’s hard to single out particular storytellers and artists from a collection like this, especially when they are all so well done. The artwork invokes the feeling of glitz and glamour from a time when most of us weren’t even alive. The writing is fun and full of great surprises. If you haven’t read The Rocketeer Adventures, I would say this is a great place to get started.